I think it might be cold enough to snow - indeed, rain/snow mix is in the forecast for tomorrow. but not today! 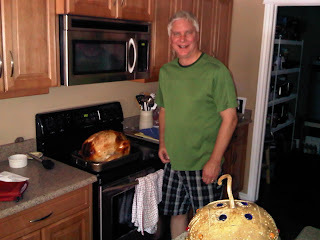 I failed to mention a wonderful blog site earlier this week - and give thanks! 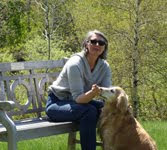 The terrific Kaye Barley created Meanderings and Muses a few years ago and it has grown into a fabulous site, a meeting place for writers and readers. Kaye is massively supportive of both, and very thoughtful. 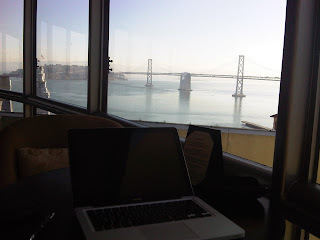 She asked me to guest blog (her one lapse in judgement) last week, and I did. Had lots of fun doing it....but then failed to mention it to anyone! SO, thank you to Kaye for that great honour - and many apologies to Kaye for appearing perhaps to take it for granted. I didn't at all - but it was so hectic I just didn't mention it in my own blog. If you don't already know Meanderings and Muses, please check it out. Am lying in bed - 1115am - second bowl of cafe au lait. Wrote the Nov. newsletter and got caught up on things that pile up while away...correspondence etc. Need to leap out in a moment, get dressed and go to the CJAD studios for a live 30 minute interview 12:30 to 1pm - with Sharman Yarnell...then lunch together. Sharman and jacquie Czernin would get along well together. Both beautiful, smart, energetic, thoughtful. How lucky to have so many splendid women in my life. And a few - it must be said - splendid men! Must run or I'll be doing the interview naked....have done loads of those in my nightmares, but not as yet in real life. Will blog tomorrow....quiet day. A day of DVD's and zoning out. Hope you get a day like that too. Definitely cool today - that damp cold where all you want to do is soak in a big ole bubble bath. Well, that's all I want to do. Let me tell you about yesterday. It was wonderful! 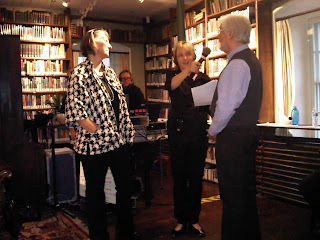 A fabulous launch for Bury Your Dead - thanks to Jacquie Czernin of CBC Radio, Peter Black her producer and a member of the board of the Lit and His. Valerie, Simon, David - all of the Literary and Historical Society. Indeed, so many people helped. And so many people came! From Kingston, Toronto, New York, Montreal - and Quebec. The old library was packed! My Assistant Lise and her husband Del brought Vive Gamache mugs, some Three Pines birthday calendar, and some special edition wines - with Bury Your Dead labels! From a local Townships vineyard called Domain Bresee. 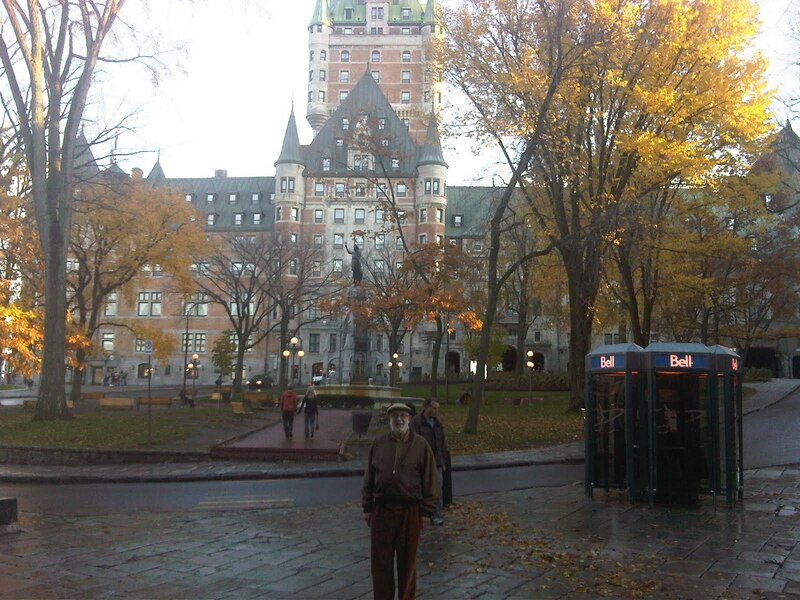 I've put up a few photos on the blog....I realize too that in yesterday's blog I talked about Michael standing outside the Chateau Frontenac - and I thought I got it onto the blog - but then noticed it disappeared into the ether. Must be attached to some unsuspecting soul's blog. Hope it doesn't get her into trouble! So these are assorted photos - mostly of Jacquie and me (I'm in the black and white checked jacket - almost always in a blur) - Jacquie's the lovely woman all in black. In one photo Jacquie's interviewing a man - that's William Moss, the Chief Archeologist of Quebec. (the real one). In the background you can see the producer of the show, Peter. It is all a bit of a blur...which might explain why I'm so blurry in the photos. But what I remember is having huge fun, being in awe yet again of jacquie and peter and Rachelle and everyone involved in the show. And the kindness and welcome of the people of the Literary and Historical Society. And everyone there. A huge thanks too to Guy Dubois - the owner of the bookstore, La Maison Anglaise. He's had me in to do signings from the very beginning, when no one else cared if I had a book out. So appreciate that. It feels wonderful to have been there, and celebrated the book in the exact place where the murder happened. 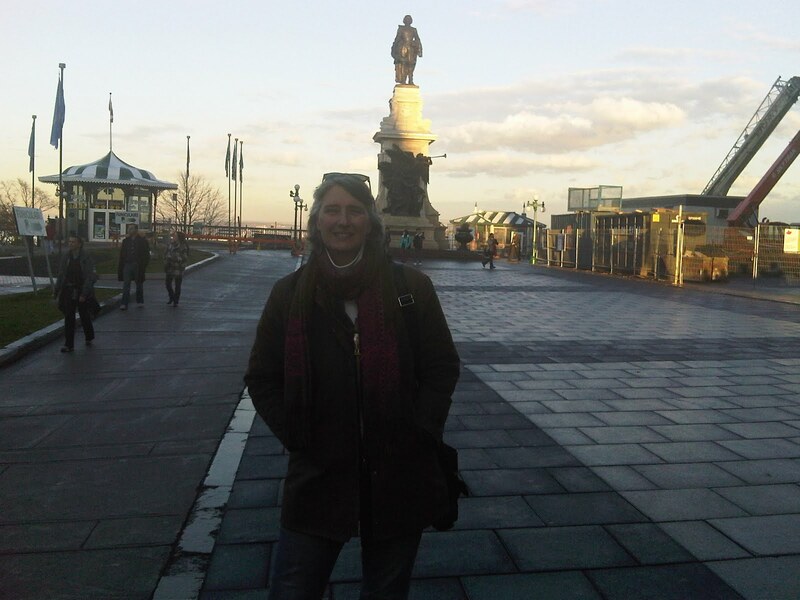 And celebrated Quebec City. What a spectacular place. Did I tell you after being woken up at 6:50 by construction the Chateau Frontenac moved us? Into - get this - one of the best rooms in the place! It was huge, with a fireplace and a turret. I'm not kidding. Wish I'd taken a picture of that. We could see over all of Quebec City and to the hills beyond. At night many of the buildings in the old city are lit up, and there's a light show over old city hall - rotating colours. Very beautiful. From the turret windows the city looks like a prism or sparkling gems. We staggered back to the hotel about 9pm - ordered burgers and sat exhausted, wolfing the food down. We were invited out to dinner by David and Louisa Blair - both deeply involved in the Morrin Centre - but were frankly too tired. After the broadcast there was a 2 hour cocktail party organized by Hachette Canada (my publisher - thanks to Donna Nopper) and the Morrin Centre. jacquie said a few words, Simon Jacobs said a few words, David Blair said a few words. I read a bit from the book. Then we partied! I wish the photos were a bit better. CBC took lots but for some reason theirs didn't turn out either. Thank heaven Michael was taking pictures. And now we're back in Montreal. Recovering! Rented a bunch of movies. Bought People Magazine. Have huge bowls of chinese soup for dinner. Tomorrow I have a noon interview with Sharman Yarnell at CJAD - then Michael and I are taking Sharman and her wonderful husband Walter out for lunch. Then home to veg. What a life. A whirlwind. And so pleased to be whirling around with you. Thanks for the company. Oh - I keep meaning to say - I know the library in Quebec City where Bury Your Dead is set as the Literary and Historical Society (the Lit and His for short)....but the fact is, it's official name is the Morrin Centre...actually the building is called the Morrin Centre, of which the Lit and His is part. I mention this in case anyone is trying to find it on a visit to Quebec. I hope you do get a chance to visit the library - the photos don't do it justice. Do you notice how our perception and definition of 'mild' is shifting? In a month 'mild' will be minus 5. Today, though, it's mild at 13. yesterday, when we arrived in QC, it was about 16 and a pastel day. An Impressionist day. Glorious. Soft light, soft, still air. Michael and I checked into the Chateau, into a room looking over the St. Lawrence river and even the statue of Champlain (seen in the BG of the photo a above - I mention this statue in Bury Your Dead) - then went for a walk. We both commented on how different it is to walk through the old city when it is a gorgeous autumn day than when the wind is howling and nesting in our marrow and it's not at all 'mild' at minus 20. Brrrr. But yesterday was picture perfect. We strolled and chatted and visited old haunts - like Chez Temporel...which I also mention in Bury Your Dead. Gamache and Emile go there for breakfast. We once again had the table with the three leaf clover scored into it, and a dimple where we rub the tip of our fingers. Hard not to. So inviting. Michael had a bowl of hot chocolate, I had a double strength bowl of cafe au lait. We both had a warm croissant aux amandes. Yummy. the photo above is me looking slightly impatient (Michael knows this look...it's impatience tinged with the promise of croissant but feet away.) just outside Chez Temporel. 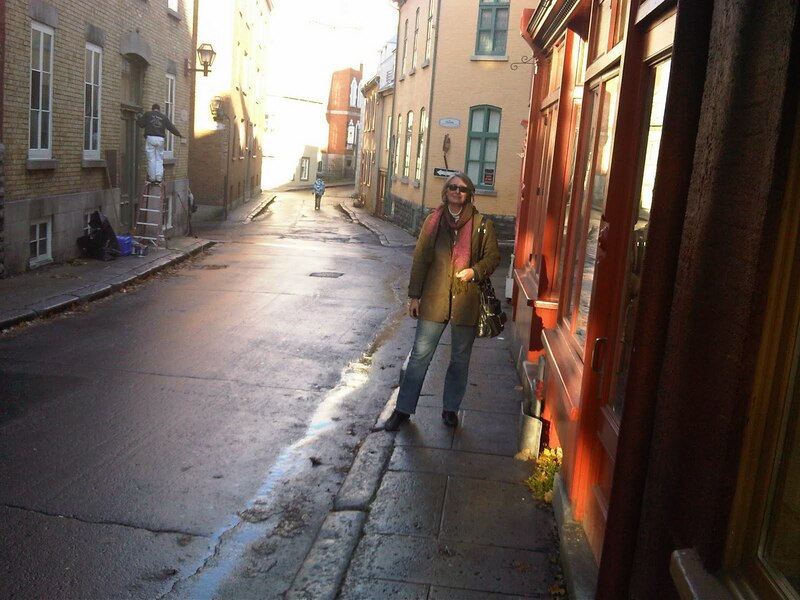 It's well off the beaten path, down a small street off rue St-Jean. From there we returned to the Chateau Frontenac....the other photo above is Michael at the foot of the park leading to the Chateau...and the bar St-Laurent. There we met My Assistant Lise and her husband Del for drinks before dinner. Then we all walked back down, through the old city, past the basillica and the tiny old streets, to rue St-Jean and the restaurant - Les Freres de la Cote. Very relaxed bistro. Then home to bed...to be woken up at 6:50 by a construction crane right outside our room!!! Ugh. I called down and they agreed this might not be the best experience. So now they've moved our room. Not sure where - and don't really care....as long as it's quiet. The only unfortunate thing is that they're doing major excavation work on the famed Dufferine Terrace that runs the length of the chateau on the river side. Wide and gracious, it's a magnificent place to walk and enjoy the views. But they found the original fortress hidden below the terrasse! Imagine that. So the archeologists are digging. Waited for the low season (and before the grip of winter) to dig...which means, now. Still, it's fascinating to look down into it and see the stone walls emerging. Busy day. Have a 10:30 interview with an academic who flew in from Halifax to speak with me for her research into Canadian literature. Then a 12:30 french interview. Then meeting Donna who is arriving from Toronto today, and Lise, at the Literary and Historical Society to go over plans for tonight. Then meeting Jacquie, the host of the CBC Radio show Breakaway....they'll be broadcasting live from the launch from 4 to 6. So we need to go over the scripts and interviews and music etc. Jacquie is doing all the work, but she's kind enough to include me in some of the planning. Then I hope to have time to scoot back to the chateau to change - otherwise I'll be at the broadcast and launch in jeans and a turtleneck. 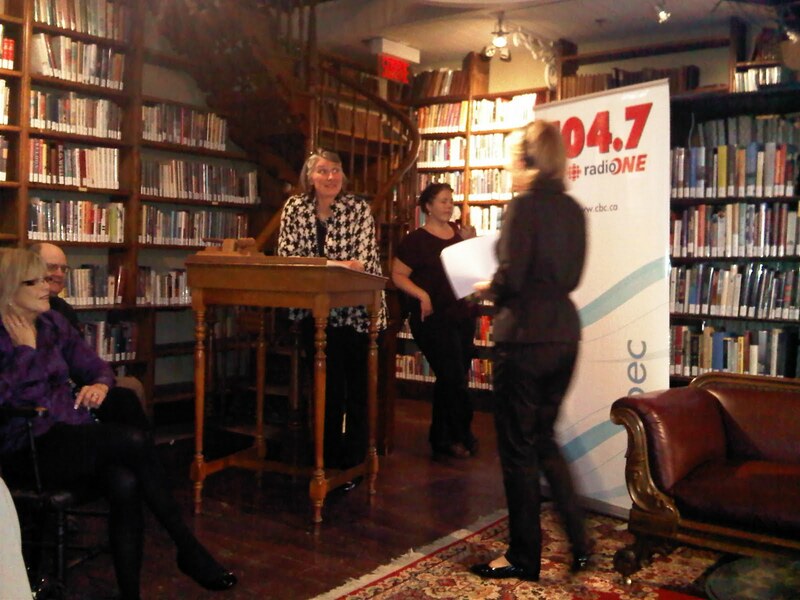 The broadcast is from 4 to 6, at the Morrin Centre - the lit and his building in Old Quebec. Everyone is welcome!!! Then the cocktail party to celebrate Bury Your Dead at the place the 'murder' happens. You're all invited to that too....either in person or 'virtually'. I'll blog about it tomorrow. We're driving back to Montreal tomorrow. Have an interview on CJAD with the fantastic Sharman Yarnell tomorrow between noon and 1pm. Then sleep for two days before the next event in North Conway, New Hampshire. Hope to see you tonight - and if not, I'll tell you all about it later! We're back in the Montreal apartment! Unpacked and immediately did a load of laundry. Then another. Then another. Our clothes practically have lives of their own at this point. You should see how we decide what to wear in the morning...but I will leave that up to your considerable imaginations. What I think you won't have any difficulty imagining is our joy. To be not quite home, but at least in the apartment. With familiar things. Oh, what I wouldn't give to stay a week here...but we're off tomorrow morning to Quebec City. Not exactly a hardship! If any place could get me happily away at this point it's Quebec City. We're off to do the Quebec launch at the actual Literary and Historical Society. Right in the library where Gamache found such peace and quiet. Shattered by the discovery of a body in the sub-basement. CBC Radio will be broadcasting the event live, and we'll be talking about all sorts of issues raised by the book, as well as speaking to the Chief Archeologist of Quebec about other Quebec mysteries. 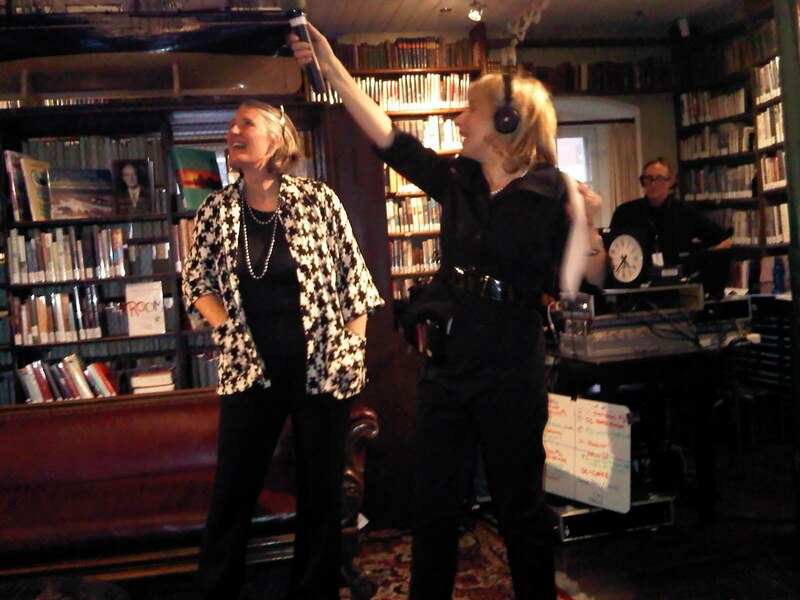 That will be this Thursday, the broadcast (CBC Radio's Breakaway with jacquie Czernin) will be between 4 and 6pm - then there'll be a cocktail and nibblies and a party celebrating. You're all invited to both events. It should be loads of fun! Michael will be there, as will My Assistant Lise - and Donna, from Hachette Canada, will be flying in for the day. But more about that tomorrow or thursday. Today we took the train from Toronto to Montreal. 5 hours. Funny how a 5 hour train trip feels SO much shorter than a 5 hour flight. 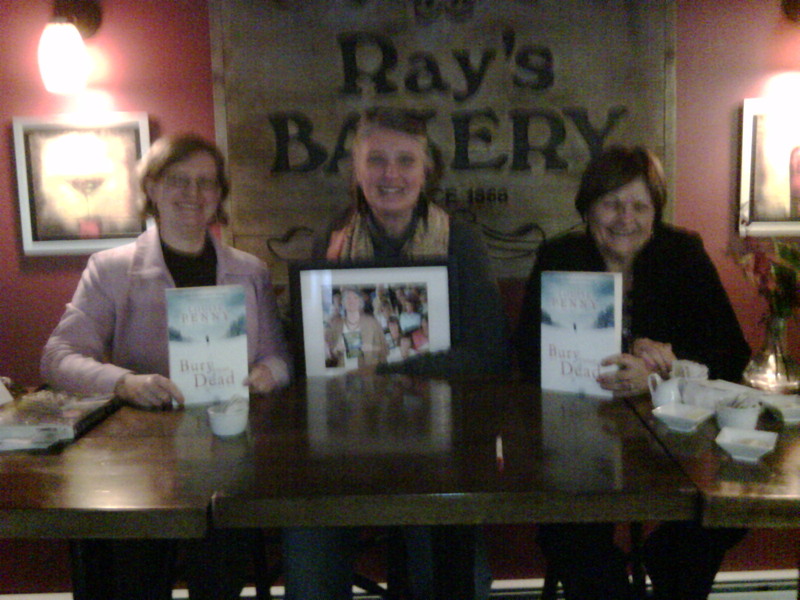 Yesterday Donna and I drove north of Toronto to the Orangeville area - to a lunch event organized by Nancy Frater, of Booklore. The photo above isn't great (nancy's on the right) but the event sure was. Sold out - packed. Great food...wonderfully attentive and enthusiastic crowd. Thoughtful questions...no spoilers. They even temporarily renamed Ray's Bakery to 'Olivier and Gabri's Bistro'. Then back to the hotel. Packed - up by 6:30 am to catch train. Listened to music, stared out the window. Emptied mind. Thought a lot about the past month and meeting so many wonderful people. Being in so many interesting places. Also made notes on the next book, as ideas floated by. It does feel wonderful to be home in the apartment - if only overnight. My Assistant Lise wrote to tell me it was snowing at home! Honestly? I love the snow. Don't love driving in it. Worse still, I hate knowing people I love are driving in it. Or worrying that they are. But beyond that, I find snow very peaceful and beautiful. Except in April. Or May. Then it becomes something else entirely. 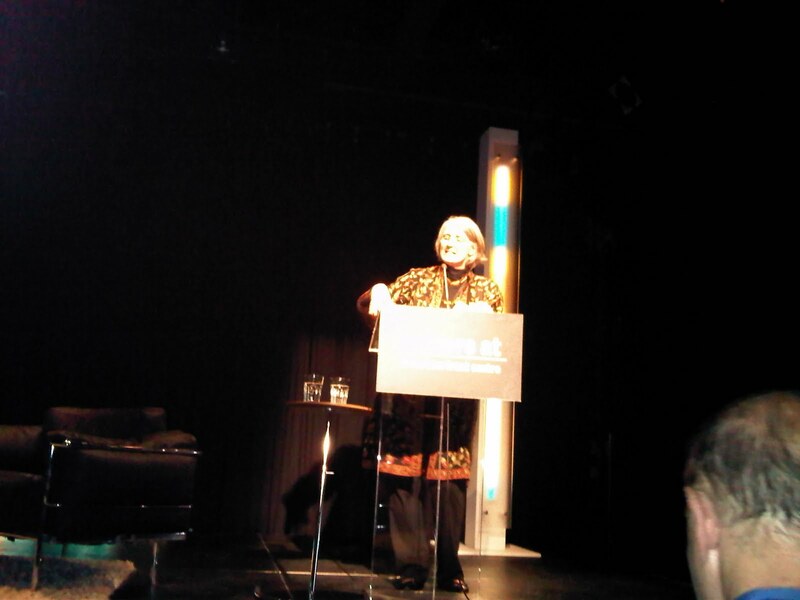 Am having great fun at the Harbourfront Literary Festival. Did the reading last night...those things are always nerve-wracking. Difficult to get up in front of several hundred people and appear composed and relaxed and happy to be there - as though this happened every night, in my living room. I went second. My preference is always to go first. Get it over with....still, second wasn't bad. And it's quite a bonding experience with the other writers. We support each other, slap each other's bum (figuratively speaking) when they finish. Congratulate each other. Like brothers in arms. there is one huge difference which I'm sure you've appreciated....instead of lobbing grenades at us, the people we're facing are friendly and warm and kind. And only want the best for us. So, the only enemy is ourselves. Our own fears and insecurities. But it's a mighty enemy, faced every day and night while on tour. The photo above is from last night's reading. In the intermission this beautiful woman introduced herself. She's Ralph Cosham's wife! Ralph reads the American audio version of the books. And is, by all account, brilliant! Ralph had emailed and said his wife was visiting a friend in Toronto and might be there - so I was looking forward to meeting her. But afraid to get my hopes up that she'd actually show. She is as lovely as you'd expect. Kind and smiling and warm. Such fun to meet her. And can hardly wait to meet him one day! I'm thinking maybe - since he lives in the Washington, DC, area - he could come to Malice Domestic in May and perhaps we could form a panel discussing audio books. Will have to talk to the organizers of Malice to see it that might fit. I know they get a lot of suggestions and it's very hard to accommodate everyone. Today there was a noon panel, which I totally loved. Moderated by one of the finest Canadian crime writers, Andrew Pyper. 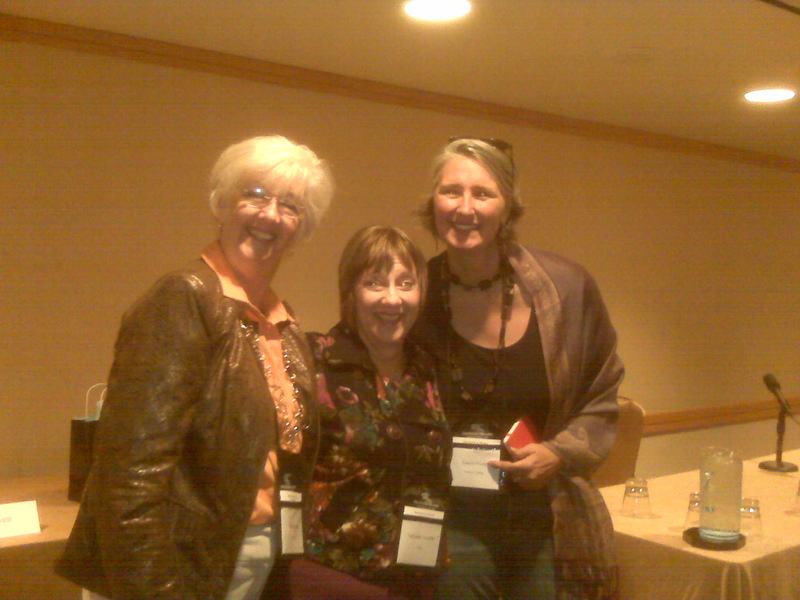 the other members were all terrific writers, Anne Emery, John Lawton and Lisa Scottoline. And me. Very fun and funny and thoughtful. Andrew did an amazing job. Very hard to be a moderator. then off to buy some new clothes. Between us, after more than a month on the road some of my clothes are ready to combust. Besides, I'm tired of them! Feels wonderful to have some new options. Had some disappointing news about the Miami bookfair late in November. I was scheduled to go, but we'd told them I could only do an event on the Sunday, since Friday and Saturday I was booked for the Montreal Salon du Livres. But could hop a plane Saturday night and get there Sunday. But, as often happens in the complex world of literary festivals and book fairs - our request was lost, so they booked me in for the Saturday of the Miami book fair. By the time the mistake was discovered it was too late. So I've had to bow out of Miami. Upsetting too since I was looking forward to meeting a very supportive book club in the area. But I'm afraid that will have to wait until next year. Life on tour. Actually, just life. So many unexpected events. Off to Orangeville for a lunch event at a local bistro tomorrow, organized by Nancy Frater and the good people of Booklore. Maybe I'll see you there! Terrific flight yesterday...air canada. got the emergency exit - three seats in a row and no one in the middle seat, so Michael and I were able to share the row, just ourselves. What a difference that makes on a long flight. Well, not that long. 4.5 hours. But long enough. Air Canada has upgraded most of it's fleet, so on longer flights every seat has it's own television. So I watched Entourage and Modern Family all across the continent. Smart enough to buy sandwiches and soft drinks...then we had a nice picnic at 39,000 feet. Quite fun. Arrived to minus 4 degrees in Toronto and a minor snowstorm just north of the city. Snuck in just in time! The International Festival of Authors is a magnificent literary festival. The current artistic director, Geoffrey Taylor, began getting crime fiction writers on the schedule a few years ago, and has quietly added to their importance. Sending the subversive message that good crime fiction is good literature. that there is no border between literary fiction and crime fiction. And this year, bless his soul, he's made Noir a theme! the other thing I adore about Geoffrey is he's one of the few literary types who recognizes that my books are on the surface bright and shiny...but beneath that is a streak of darkness. But at their heart - hidden under it all - is hope. And kindness. That noir and blanche live together, naturally. And need each other. It's a great pleasure to be here, and be a part of this revolution. Peter Robinson, Lisa Scottoline, Giles Blunt, Jeff Lindsay, RJ Ellory, Peter James and others standing up and letting our literary voices join those of Michael Cunningham, Emma Donoghue, Jonathan Frazen etc. Besides - it's just plain fun. Have a noon signing tomorrow with Lisa Scottoline at the Indigo bookstore at the Manulife Centre - then a reading at 8pm at the IFOA. Then a roundtable discussion on Sunday at the IFOA with Anne Emery, John Lawton, and Lisa - moderated by a terrific Canadian crime writer, Andrew Pyper. It's funny, but as wonderful, magical, generous as San Francosco was - there's something special about being here. It has surprised me. I wonder if it's just being back in Canada - or being at the IFOA... a familiarity issue. Being this close to home. I think it might just be familiarity. As much fun as this tour, and as kind as everyone has been, what gets tiring for me is never being anyplace familiar. Every place is new. That can be exciting...but given my personality, after a while I really just want home. or, if not home, then places I recognize. Like here. Of course, I might just be nuts. Speak to you tomorrow. Hope to see you at one of the events. Have a great weekend! Had two calls early this morning. 6:45 call from the French publisher, just to chat. Then 8am call from Teresa, my agent in London. To make more plans for the visit. 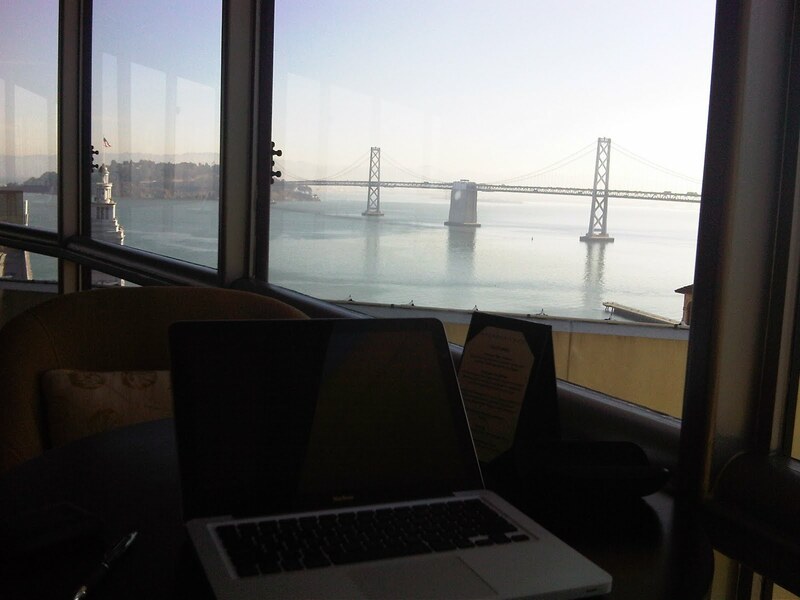 Fun to lie in bed in San Francisco talking with editors and agents. Never would have believed it possible ten years ago. We're having a VERY relaxed day. Getting caught up on some work. Some blogs and emails. Some planning and scheduling issues. Off to Toronto tomorrow - mid-morning flight but with the time difference we don't arrive in Toronto until 7pm. Going to be doing the International Festival of Authors (IFOA) this weekend - then have a lunch event organized by the amazing Nancy Frater, of Booklore in Orangeville, Ontario. If you live in the area and want to be part of it, please call the bookstore and they'll give you information. Hard to believe that one week from today Michael and I, along with My Assistant Lise and her husband will be in Quebec City! The big Quebec launch of BURY YOUR DEAD is a week tomorrow - Thursday, Oct 28th. Wow. Hope to see you there. One thing that amazes me, and I suspect amazes other writers (in fact, I know it does) is simply the number of details involved in a writing career. Like so many others, I thought I'd just write, and maybe tour (using the publisher's private jet) and that would be it. Get to meet you, and enjoy it - then fly back home. Seems there's more to it than that! Tons of emails, blogging, phone calls, organizing and co-ordinating meetings. Thank God for My Assistant Lise, who basically does everything for us. And still I can barely function for the details. Having said all that - this is still the best job in the world! I probably won't be able to blog tomorrow, but will try to write on Friday from the IFOA. Be well. And thanks for the kind company. Ahhh - a day to ourselves. Woke up about 8. Breakfast about 9. Then decided to go for a walk. Five hours later we got back to the hotel! Walked all over Chinatown, then Michael and I walked down to the waterfront. We were going to have lunch in chinatown, but we weren't hungry yet, and were yearning (against all our instincts and our nature) for exercise. So off we set for Embarcadero blvd. Lovely walk. Fabulous city. We were aiming for Pier 39 - Fisherman's Wharf. Hoping to find a great, atmospheric seafood restaurant. What we found was overwhelming - and not in a good sense. Just lots of tourist traps. But we did pause long enough to see the sea lions, who make the waters off Pier 39 home. There's a photo of Michael, with the lions in the background...looking a bit like hors d'oeuvres. 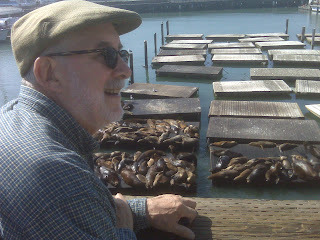 Then we hoofed it off to Pier 7 and the Waterfront Restaurant. Had the BEST lunch - perhaps ever. Sat outside, looking over the harbour and the Bay Bridge. Michael had seafood linguine. It was amazing!!! And I had perhaps the best halibut I've ever tasted. Honestly, it was terrific. Another magical time in San Francisco. Yesterday, when we got back to the hotel room from lunch there was a beautiful bouquet sent from Minotaur Press and St. Martin's. How wonderful is that? Oh, also want to mention that next week - on October 28th - we'll be in Quebec City for the Quebec launch of BURY YOUR DEAD. We'll be doing it at the Literary and Historical Society - where much of the action in the book takes place. And it will be broadcast live on CBC Radio Quebec. From 4 to 6 - then a party after. Everyone's invited!!! In fact, the Canadian publisher, Hachette Canada, has arranged for a special rate for rooms at the Chateau Frontenac, for those of you who'd like to come for the launch. 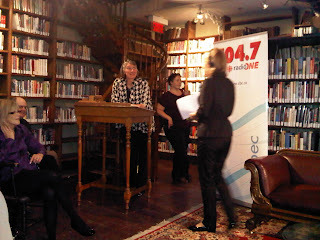 If you call the Chateau - at 1-800-441-1414 - just say you're booking for the Louise Penny book launch, and if they ask for the code give them, HACH1010. It would be such fun to see you there. Quiet day tomorrow...wow. Feels wonderful. I'm still floating, and will be for quite some time, after yesterday. The shriek and maniacal laughter in my head has calmed to a smile of settled happiness. And people have been so kind, coming up to congratulate me. And sending messages. Had there been a long, dreadful silence after this great news that would have felt awful. But you are all so kind. Thank you!!! And mostly thank you for keeping me company, when I win and when I don't. When things go well, and when they don't. That's the real trophy. Companions like you. We've cancelled the event in Berkley tonight. I know a few of you were hoping to be there. I'm sorry about that, but it has just been such an exhausting time we thought it might be best. Just need to stare at a blank wall for a little while. Indeed, the photos above show what I'll be staring at. One is our living room in the hotel room, the other is the view from one of the windows. I've also included a shot of me holding the Anthony...before they took it away to be engraved. (ripped it out of my hands...I think there may be nail marks on it.) In most of the photos of me at the awards I look like a striped cow. But one holding a magnificent trophy - so, moooo!!! What a surprising life. I will remember this always....but mostly I'll remember all the people who have been so kind to me. Thank you. The most beautiful day - THE BRUTAL TELLING has won the Anthony Award for Best Crime Novel in the United States!!!! I was so totally unprepared that when my name was announced I just leapt up and kissed Michael - and didn't want to let him go because I knew it would mean going onto the podium and accepting...and I was literally speechless. Now, of course, I can think of all sorts of touching, wise, sparkling, clever things to say. And all the people I should have thanked!!! But all I remember was thanking the readers - who have found the series - an unlikely success at best, given it's set in a tiny village in a little known province in a small (politically) country. And yet, there I was, standing in front of a thousand people, accepting the award. I was - and am - so deeply grateful. I know I also remembered to thank Michael - and then was walking off the stage, still in a daze, but remembered (too late) that I needed to thank Hope Dellon and everyone at Minotaur Books - for making them better than I ever could. so I say it here. Yay!!!! Especially given who else was nominated. I genuinely thought SJ Rozan would win. But I know everyone in that category deserved to win. And many who were not nominated. After the awards brunch Michael and I hopped a cab to the hotel, then decided to walk and find lunch. Ended up at this fabulous little neighbourhood placed called the Nob Hill Cafe....Italian. There's a very bad photo of Michael, just raising his head from slurping up his pesto fettuccine. And thank you, for celebrating along with me. And thank you too, I know many of you voted for me. I wish you could crawl into my heart and hear the symphony. Yay... I can't seem to stop saying that!!! Back in the room now, going to spend the afternoon relaxing and enjoying. Wow, temperature really changing...not really all that cool, but unexpected, so we didn't wear sweaters outside, then shivered all over. Took the cable car yesterday afternoon- have I told you all this??? Can't remember - so much happening. If I have, please just consider me the mad aunt in the attic - escaped into the blogosphere. Loved the cablecars...stopped and hopped off at the Mark Hopkins hotel and begged our way into a room starting tonight - Saturday and running until Thursdya when we leave. We paid for a deluxe room and when we checked in today we discovered they'd given us a one bedroom corner suite. Talk about a soft landing. 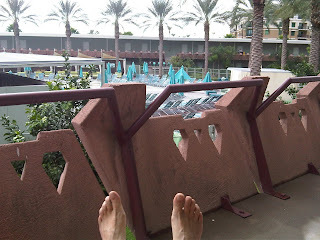 The longer we stayed at the Hyatt Regency the more we were put off. Though for no particular reason. Everyone was very nice - and the location was great...certainly the view from the club lounge was exceptional. But it just felt so cold. Now, I've become a huge fan of modern design....but not the cold kind. I realize it's possible to be 'cool' without being cold. Some hotel design is spectacular. Modern, clean, functional, beautiful- thrilling. I can literally tremble I'm so excited by some of the design. But others are just plain cold... and not particularly well thought out. some of you, quite sensibly, suggested we call down and ask for a bedside lamp - but the problem was the table they put on my side was just large enough for the phone they put there. I couldn't even get my book on it without putting both at an angle. Now, the room would have been wonderful, for one person. 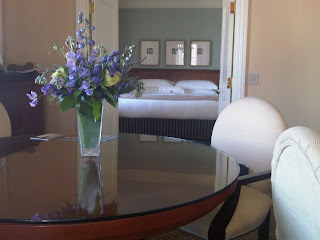 But I must tell you, at the Mark Hopkins the room (upgraded partly because we're InterContinental Ambassador Gold level - the perks of lots of travel) is amazing. A little like walking back in time...more classic than modern - but beautifully done. And not dreary or tired, as so many of the these older hotels are. We're thrilled and relieved. And excited to be here. And very grateful for the upgrade well beyond what we might ever expect. And so wonderful to have the extra room - given we're here for 5 nights. Having a fabulous time at Bouchercon. Had drinks last night with a group of women Marjorie organized....Michael picked up the tab - lovely man. And thank you, Marjorie, for the wonderful licorice pipe bookmarks - and organizing this. Most are members of the Laurie R. King book club - Laurie is also the guest of honor at this convention. There's a photo at the top of Michael and me with some of the people. Then at 8:30 this morning I joined Rhys Bowen and Deborah Crombie for the Goddess Panel - a sort of reprise of a panel we first did at Bouchercon in Baltimore. No moderator, just the three of us chatting. It helps that I am a huge fan of both these writers...and both these women. I genuinely like them - a lot. Indeed, Deborah and I are hoping to get together in a few weeks in London. We had a blast on the panel...and thanks to all of you who showed up early to hear us. The place was packed. There's a photo as well of the three of us after the panel. 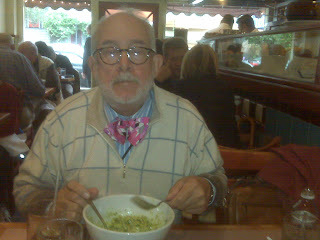 Then I had breakfast with my friend Dan Mayer, of Barnes and Noble. Then Michael and I decamped to the new hotel. Phew. Having afternoon tea in the lounge and listening to the clanging of the cable cars. Magical. Quiet evening - then the Anthony Awards brunch tomorrow. THE BRUTAL TELLING is up for Best Novel. I have not prepared a 'thank you' speech. And, honestly, to be nominated really is enough. I'd really love to win - but to be recognized for the nomination really is fabulous. last year I lost the Barry Award to Deborah Crombie - and I was thrilled to applaud!! She so deserved that win. Hope you're well - will blog tomorrow and tell you how it goes. But how bad can life be when we're together in a suite in the Mark Hopkins in San Francisco? Gorgeous day. Here's the view from where I'm sitting right now. The Regency club level of the Hyatt. Magnificent. Had breakfast here at 7:30 with Marjorie. Here's a shot of us. Not, perhaps, the best photo (we sparkle more) - and you can't see the view in that photo. Had such fun actually sitting with Marjorie - and Michael joined us. I met her for the first time at the event a couple weeks ago at RJ Julia, in Connecticut. But we didn't get a chance to do more than hug and say 'hi'. 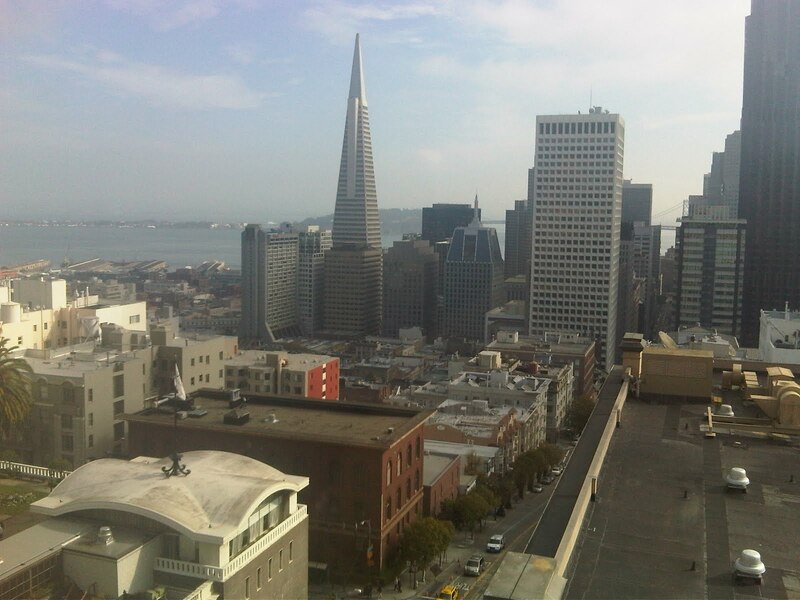 We're here in San FRancisco for Bouchercon - this massive crime fiction convention organized by and for readers....and we lucky writers get to come and meet the readers - and each other. We flew in from Calgary yesterday and went directly to lunch with Andrew Martin - the publisher of minotaur and Matthew Shear the president of St. Martin's. Great restaurant - greek...huge open fireplace, amazing fish. And so fun to see these two people I so admire and like, whose company I honestly enjoy and don't simply endure. or get all nervous. We've known each other for 6 years now, and feel like brothers and sister. It's an interesting relationship. Publishing is still, in many ways, very old fashioned. Still so dependent on personal relationships. And yet we all know it's a business. They'd drop me in a moment if the Gamache books stopped selling (well, not a moment, but eventually, as they should) and I'd leave if I felt I wasn't valued or respected. But that aside, we genuinely like each other. And that means the world to me. I no longer choose to work with people I don't respect and admire. Did the old hotel shuffle when we got back...trying to find a room we (I) liked. So far no luck - and since we're staying for a week we're considering leaving....any suggestions on great San Francisco hotels - in interesting, fun neighborhoods? the view from this club level is magnificent, but the rooms are small, and dark....and there's no bedside lamp on my side. I find that so odd in a room that's been newly renovated. And disconcerting. don't people read in bed? Honestly, that's the big thing driving the move. Sounds so trivial - but I so love lying in bed after a long day, and reading. Poor Michael - dragged around again. The hotel tour of SF. I'm joking, actually. We don't spend all that much time trying to find a good room....this is way to magnificent a city to waste too much time doing that. Gives me the shivers. And congratulations to the winners of the Macavity and Barry awards last night!!! The macavity for best novel went to Reed Farrell Coleman and Ken Bruen. And the Barry for best novel went to John Hart. The Barry for Novel of the Decade went to Stig Larsson. 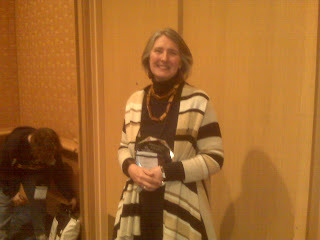 And my Lipstick's Chronicles sister - hank Phillippi Ryan won the Macavity for best short story. And the terrific Alan Bradley won for Best First Novel - both the Macavity and the Barry....what a year he's having - and deservedly so! All so well deserving, everyone who won! Have a small gathering tonight in the hotel Atrium bar, organized by Marjorie, of readers who might want to meet with me informally. As I say, it's a modest gathering - not everyone knows about it - but if you're here and would like to drop by, feel free. It's between 6 and 7. Off for more San Francisco fun....will blog tomorrow. Though, honestly, we haven't been out yet. Our room is terrific. though poor michael had to once again put up with me walking all over the club floor with the concierge, checking out different rooms until we found the perfect one. Concierge was very patient... but you can imagine how patient Michael has to be! This is one of those old Canadian Pacific Hotels, built as they build the transcanada railway line...one massive hotel in each major stop....halifax, Montreal, Toronto, Winnipeg, Regina, Calgary, Lake Louise, Vancouver. Most now well over 100 years old. And many getting a little weary, a little dreary. many of undergone much need re-furbishments. This one - the Palliser - has not. At least, not for about 40 years. Still, there's a grace to the lines and proportions. Our room has massive high ceilings and three tall windows looking over the quite magnificent city, and the mountains beyond. We were zonked, so after some work, we ordered room service. Fish and chips. It arrived on a trolley, with a heating compartment and white linen and old sterling silverware and it almost made me week knowing our grandparents on trips across the country were probably served on the same china and ate with the same utensils and gazed upon the same mountains. I have to say, while some of the furnishings and fabrics are a little worn and dated, the service and attention to detail is better than we've received anywhere else. This morning we asked for a walk up called at 7am. it came - a real person. then at 7:15 there was a quiet tap on the door and there was a concierge with a pot of coffee. Off to the big fundraising dinner tonight. Fortunately it's in the hotel, so no need to go far. I wonder if I can wear slippers? Thank God no one expects much from authors. In fact, the more eccentric the better. So I keep telling Michael. he needs more convincing. Wow, what a difference a day, and a flight, makes. It was sunny and warm for the past two days in Regina - unseasonably so. But lovely for Thanksgiving. Had a great time with Rob and his family - and the rest of the family. So wonderful to see everyone getting along. it wasn't always so. Just growing pains. It sure took my brothers and me a long time to appreciate each other, to genuinely care for each other. And now we're so happy to be in each other's company. And as I said yesterday, the greatest pleasure we all got was seeing all the cousins together. Flew to Calgary, Alberta this morning. Short, easy flight. About an hour. Arrive in late fall, suddenly! Was picked up at the airport by just about the nicest person on earth. 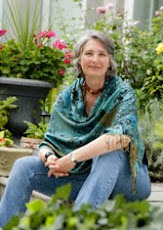 Anne Green. She's the head of the Calgary WordFest. A great literary festival. She runs the whole thing - with hundreds of paid employees and volunteers, of course. She does all this and still manages to be kind and thoughtful, effective and smart. And warm. Michael and I just adore her. We initially said no to coming to the Calgary WordFest this year, since the schedule was way too packed, but then we heard it was Anne's last year, so we re-arranged all sorts of things to get here. She needs to be celebrated. and we sure want to be among the voices raised to thank her. And cheer. We're taking her out for a private lunch tomorrow. Have a chat with my agent, Teresa, in London tomorrow morning - then a 40 minute interview for CBC at 10am - I think it's being recorded or something for the website. Then lunch with Anne - and a gala 200 dollar a plate fundraising dinner tomorrow evening. Michael was dis-invited because there was so much interest, they, well - they sold his seat. Understandable. And I'm not at all sure Michael's sorry. As an author I'm sort of part of the attraction, apparently. So Michael gets to sit in his flannels and order room service. 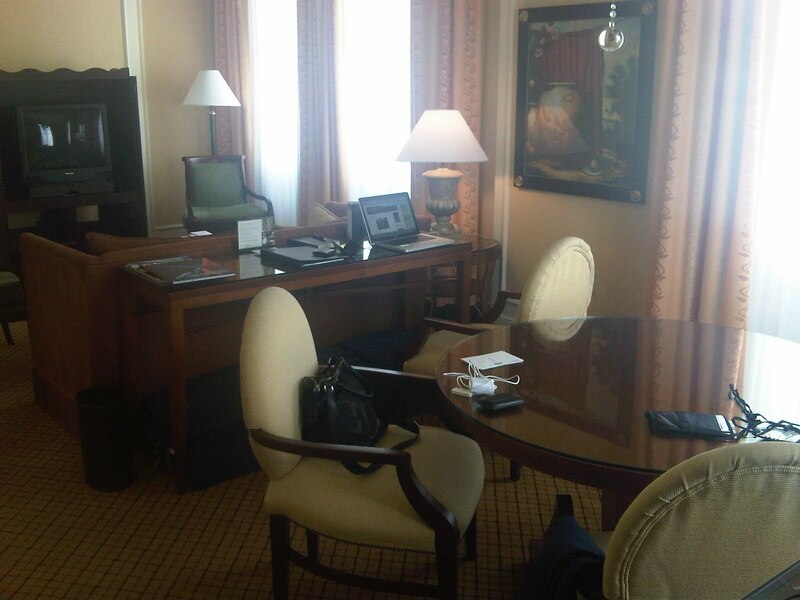 We arrived at the Fairmont Palliser Hotel in the early afternoon and immediately upgraded to the Gold Club level. As this tour progresses I'm finding an even greater need for pampering. Against my nature, of course. The tour continues. Hope you're well - and for the Canadians....Happy thanksgiving Monday! And thanks to all of you who sent Thanksgiving greetings. How thoughtful you are. It's Canadian Thanksgiving! Michael and I are finally together. Met at the airport in Regina (Saskatchewan) Friday night. with my older brother, Rob. What an amazing feeling. Two men I love standing there, waiting. And to get huge bearhugs from both. Made being away worth it! What wasn't waiting was my luggage! It got lost. No big surprise, really. I'd booked it through from Houston, to nashville, to Denver to Regina. I've been extremely lucky with my luggage. Can't remember ever losing a bag. What made this a little stressful was that I'd lost the baggage tag! Fortunately there wasn't anything irreplaceable in it. Jewelry, and this really nice embroidered evening coat I was hoping to wear to a formal dinner in Calgary on Tuesday and the bouchercon opening ceremonies and all the cocktail parties (and dinner with my US agent) Thursday. Bit of a shame, but not a disaster. Fortunately it showed up the next day...yay. I can't begin to tell you how it feels to be with my family. Rob and Audi and their children, Kim, Adam and Sarah. Doug and Mary and two of their kids...Roslyn and Charlie. And Michael. One of the photos above shows the cousins together, most in their Saskatchewan rough Rider green jerseys...on their way to the big football game...Saskatchewan vs Toronto. (toronto won). A friend of Adam's - Andy - is visiting from the UK, and he's spending the holiay with us. the other photo shows the kids, minius Kim - wearing the 'freebee' from Rob - little yellow rubber 'hardhats'. Very proud. Not many could carry off this look.... (no, don't say it). When our mother died ten years ago we realized unless we made an effort we ran the risk of drifting apart. All with busy lives. And that would be terrible. So once a year, around Thanksgiving, we get together. The event at Murder By the Book was such fun!!! Saw old friend Catherine and Ron after decades! Saw Cay and Billie and the 'two J's'. FAbulous Dean (whose latest book stayed THREE weeks on the NYTimes list!!!) and handsome, generous, brilliant John, who works at the store and interviewed me. It was standing room only - and everyone was so welcoming. But, of course, as wonderful as it was to see everyone there, the most glorious was McKenna. The owner of the store. Who recently lost her husband, David. Such a beautiful young woman. We talked about David. Not about his death, but about his life and his plans. McKenna's mother, Brenda, was there - so supportive. Making sure her daughter knows she's not alone. 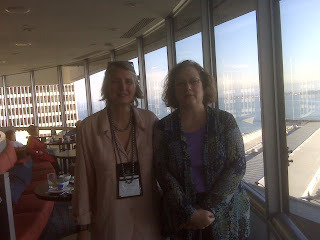 McKenna and her friend and co-worker Anne will be at Bouchercon. when McKenna and I embraced and kissed we both leaned in the same direction - and almost lip-kissed. then spent the night kidding each other that 'people will talk'. Early flight Friday morning to Nashville. Beth met me at the airport and we zipped into the city...like most people I only think of country/western music and the Grand ol Opry. which is tribute enough. But it became clear immediately that Nashville is that, and much more. A very, very beautiful city. 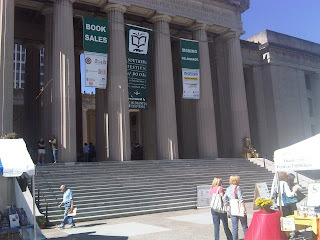 I was there for the Southern Festival of Books. One of the photos above shows the amazing state building, where the festival is held. Wonderful group of people. Very warm reception. thank you to everyone who took time to come out! I just loved seeing you all. then back to the airport...flight to Denver....then to Regina. Arriving about 10pm. Phew. And now home. With Michael. Fabulous news from the publishers!!! Thanks to you, BURY YOUR DEAD has made the extended New York Times list!! Number 21. Yippeee..... I'm frankly not only thrilled, but stunned. The Brutal Telling, my previous book, made it to 19 on the extended list, but that was because it was the Barnes and Noble Main Selection, which gave it a huge boost. We were all pretty convinced that without that boost for Bury Your Dead we wouldn't make the list. But we did!!! And while the rank is slightly lower, the sales numbers are actually up! Again - thanks to you! Buying the book, buy also telling so many others about the Gamache books. I'm just so happy about this. Also made it to number 16 on the Independent Booksellers Bestseller list. Yay! Had dinner in Phoenix last night with Lesa and Patti, then we went over to Poisoned Pen - this really remarkable mystery bookstore in Scottsdale. Place was packed. Phew. Patrick set us up....and two bottles of champagne appeared - to toast the NYTimes list! Karen hosted the event and did a magnificent job. I adore Phoenix and this particular store. And I've been here often enough now that I know many of the readers who come to the events. It feels like family. they even ran out of copies of Bury Your Dead and had to scramble to get more from other stores. Also ran out of The Brutal Telling. Have an event tonight in Houston (am at the airport waiting for the flight) at Murder by the Book at 7. Hope to see you there! This really is a wonderful tour! And the news about the bestseller sure is energizing! Now, the key is to keep traveling and keep spreading the word. With your help. Well, hot to me, but apparently this is a cool spell in Phoenix, where last week the temperature hit 105. I've never felt heat like that. 85 is good enough for me. amazing storms here yesterday. I don't know if you heard or saw some of the footage of the hail, that actually accumulated so that kids were making 'Hailmen'. Amazing video of hail like large stones plummeting into a pool, causing these massive splashes. A major highway closed (at rush hour) because of flooding and downed powerlines. I sat on the balcony watching it arrive. 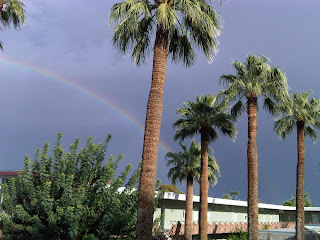 In fact, that shot of the rainbow was taken as a storm approached. then has to retreat inside as the rain became too violent. The temperature dropped 30 degrees in 20 minutes. Remarkable. The other photo is me, or at least my delicate feet, waiting for the storm. As you might have guessed, after yesterday's post, I switched rooms. To a lesser room, but one with a nicer view, over the pool. Lovely. Sat outside this morning with a coffee, before the sun hit directly and it became sizzling hot (for a Montrealer, anyway). Had great news about the French book. En plein coeur (the french translation of Still Life) has risen to number 2 on the Le Devoir bestseller list! Having an early dinner tonight with Lesa Holstine and Patti O'Brien, then off to Poisoned Pen - a terrific mystery bookstore here in Phoenix (scottsdale, actually) for an event tonight. Flight to Houston tomorrow - and an event at Murder by the Book. So looking forward to that. To seeing McKenna and Brenda, Dean and Anne and meeting John. Friday is very busy - early flight from Houston to nashville. Have a noon event at the Nashville literary festival, then two more flights to get to Regina for our family reunion Thanksgiving. Will try to blog tomorrow, but if not, I probably won't get a chance until the weekend. Be well - and thank you for all your support of me, and of BURY YOUR DEAD! What a fun and exciting launch week. Thanks to you. Can you believe it? Phoenix has been sunny and hot for 150 years and the next day or so will be rainy and stormy. But, frankly, I don't really care. It's nice and warm and not too hot. Woke up early (because of the time difference) ordered breakfast and sat out on the balcony eating fruit, sipping a smoothie and coffee and enjoying the warmth. and the palm trees!!! What an amazing life. Am staying at a hotel with the silly name, Valley Ho (I know - don't say it). 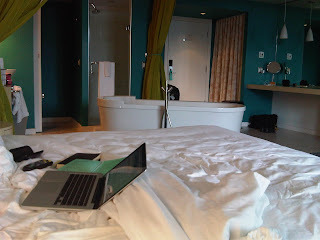 But terrific hotel - one of my favorite - though I have to say my room (an upgrade) is a little odd. Bathtub in the centre of it. There's a photo at the top. And while it has a lovely balcony, there's no view. It looks directly into the concrete wing opposite, and the guest rooms there. Though off to either side I can see palms...so that's great. I've actually asked if it's possible to get a room with a nicer view, since I'd hate to spend two days in phoenix and except for the warmth I could be in Moscow. Woke up yesterday in the wonderful Norwich Inn, in central Vermont. Put the fireplace on. Showered and went down for breakfast. Then packed and got ready for the luncheon, organized by the Norwich Bookshop....a magnificent independent bookstore. One of the terrific and invigorating things about this book tour is seeing how many vibrant independent bookstores there are still. those that have survived seem to be thriving. Though I know it's hard work. The Norwich bookshop in one such amazing bookstore. Penny - who hosted the event and works at the bookshop - cut the last flowers from her garden...phlox, hydrangea, etc - and put vases in Sarah and my rooms. So beautiful. sort of bittersweet actually since it reminded me so keenly of home. The event - a lunch at the Inn - was terrific. 50 plus people. Each with a copy of Bury Your Dead. I had a chance to chat with most everyone one-on-one...then while people were still eating I had to start the reading (thanks to Penny who kept us on schedule) because we had to be on the road from central vermont to New York City by 1pm at the latest. People were so tolerant. I'm sure they'd just as soon have been able to finish their lunch, then listen to me - but they had to multi-task. Eat and listen. I'm very gratful to the guests for understanding, and to the Norwich Inn servers for being as quiet as possible. At 1pm Sarah and I rushed off....felt like thieves in the night...Sarah had already gassed up the car. (We keep getting these hilarious emails from Andrew Martin, the publisher, calling us Thelma and Louise and wondering if we need more ammo). Five hours later (in rain and heavy traffic) Sarah pulled into JFK. She did such an amazing job, getting us all over New England - with hardly any casualties. I really, really want to thank all of you SO much. for buying Bury Your Dead. For spreading the news. for reading it and being so supportive...and telling others. And being SO careful not to ruin it for others. I know how hard that is...but my heart swells with gratitude and warmth when I read a review where people are kind - and considerate. Oh, I wish I could find the words to tell you how much I appreciate that. I really am deeply moved by your efforts. And also want to sincerely thank all the people who take time from busy schedules and lives to come to the events! I'm surprised that I'm not really tired - and on the flight I thought about you, and realized I'm not tired because I feel all your good wishes, and it energizes me. A huge thank you for that! And I hope you feel the energy and warmth I'm sending your way. A day off today...feels amazing and a little odd not to be considering and preparing for the next event. Oh, it's raining! hard. Just ran out onto the balcony. warm shower...and very fragrant out - the moisture on the tropical flowers. so I get to experience what most humans have never seen...rain in Phoenix! Yet another gift of this wonderful tour. We're now in Norwich, at the fabulous Norwich Inn - which is in this picturesque Vermont town. Really, it's like walking into a Capra film, or a postcard. Lovely. 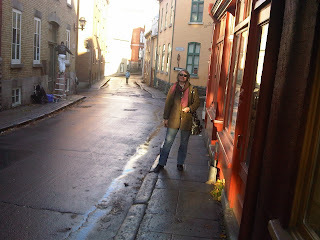 Have had loads of fun since I was last able to blog - which seems a long time ago. 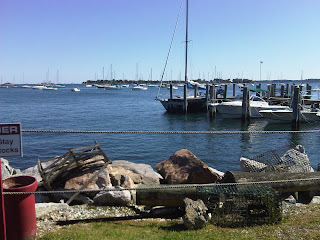 When Sarah (my publicist) and I left Providence, RI, we headed north to Mystic, Connecticut to sign in a small bookshop. 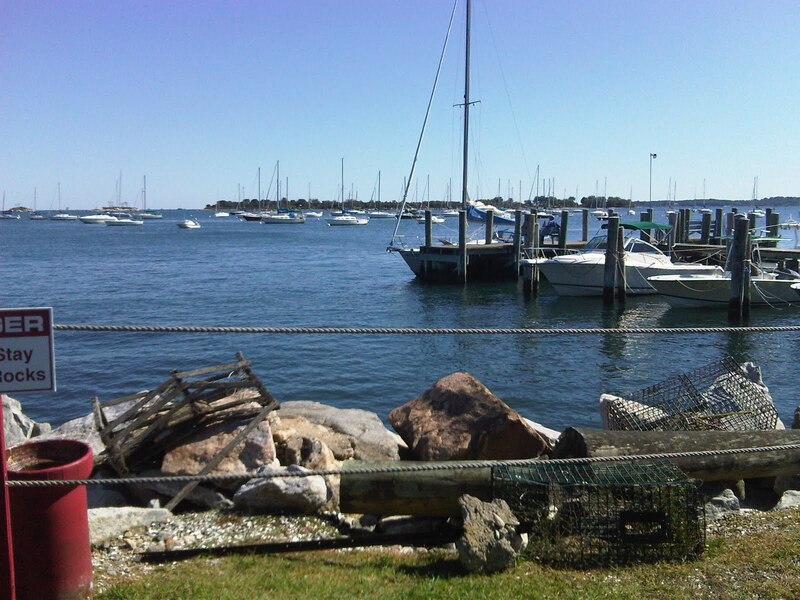 Mystic is as lovely a town as it sounds. Right on the ocean. Old fishing port. I want to move there. After I'd done the signing we asked about a place for lunch. It was a brilliant, sunny day. Glorious. And the woman suggested Abbots, just down the road. So off we went, to discover that Abbots is lobster joint. All sorts of lobster dishes. 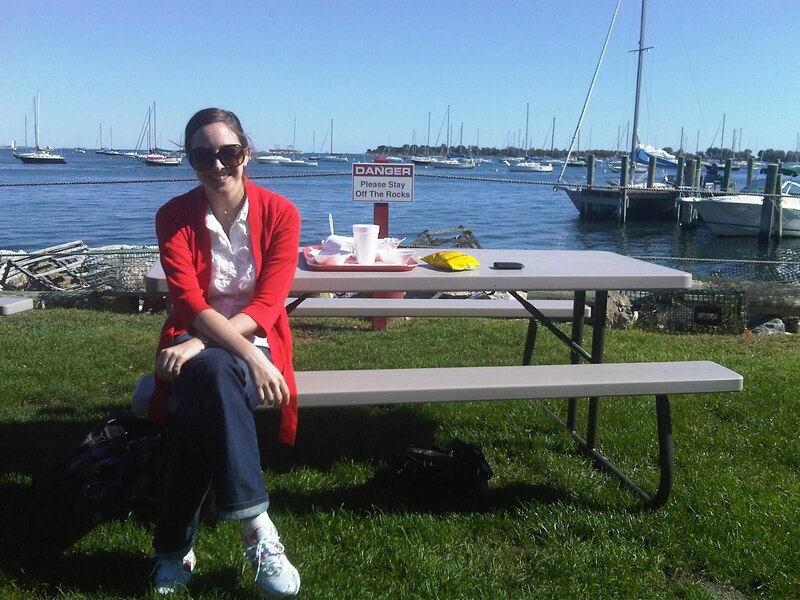 You order, then grab a picnic table on the shoreline, and eat there. The photos above show Sarah at our table and the view from the table. This was our office on Saturday. I feel an evil laugh bubbling up. It was as magical as you might be imagining. 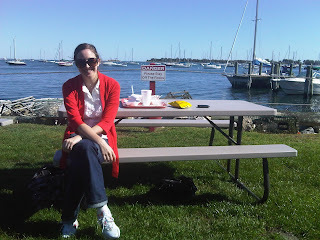 We both had clam chowder and a lobster roll. The only thing missing - always missing - was Michael. He loves the ocean, and all things from it. But the thing he adores above all else is a great lobster roll. So we called him, in hopes of including him - but I think it just succeeded in making him jealous. So all was not lost. We then drove on to Madison, CT and checked into a very dreary Bed and Breakfast. But it was clean. Hope, my NY editor and her husband Charlie drove up from NYC for dinner Saturday night in Madison with Sarah and me and then we all went off to the event at this magnificent independent bookstore called RJ Julia. Wow. Not only was the bookstore absolute perfection - the people who work there are passionate, welcoming, warm. Lisa was the one who looked after us, and introduced me and she was so gracious. What a difference it makes when you're made to feel welcome and precious. Whether at a big book event, or in a restaurant, or on a date. The place was packed. Which always feels wonderful. I spoke for half an hour, answered questions - extremely intelligent and thoughtful questions - then signed. And had a chance to meet a number of you! Including Marjorie and Amy and some others. Thank you SO much for coming out and being so supportive. Next morning over breakfast we got to chatting with the other visitors at the B&B - all fascinating, including a criminal defense lawyer from Florida, a man who writes books on the blues, the executive in charge of DC Comics merchandising (and formerly in charge of the Macy's Thanksgiving day parade) - a British rock musician about to do a reunite with her band and record another album and her professor husband (Parisian) who writes about human rights in africa. It was a fascinating conversation. And all of us strangers at this Vermont B&B. But so far, while a little tiring, it's been such fun. We arrived in Brattleboro - magnificent drive through forests and mountains. Went to Amy's for homemade soup and bread. Then did the event in this glorious, light-filled Congregationalist Church. good number of people. Again, spoke, answered questions...signed. And headed out by 5:30. On the road to where we are now...Norwich, VT. I have a noon event here. A luncheon and talk. Then we have the 5 hour race down to JFK airport in New York in time for an 8pm flight to Phoenix. We're not totally convinced we'll make it...especially since we'll hit rush hour and some rain. But we'll do our best! Wish us luck - and hope you're enjoying the tour so far! Storm has passed. Sarah has arrived. Am having a blast in Providence. Went to the New England Independent Booksellers association author cocktail last night. Huge event. All sorts of booksellers there - wine flowing, terrific finger foods. People meandering between booths. And about a dozen invited authors at tables at one end, with a daunting stack of books. And then one person wandered by. I chatted with her, signed a book, chatted, chatted. It's a sort of literary hostage-taking. Can't let her go or I'll be exposed. And then I noticed there were more people lined up behind her. And more. And before long a long line had formed. They were either the Bookseller's Swat Squad (formed to rescue a colleague from a desperate author) - or they genuinely wanted a signed copy of Bury Your Dead. They wanted the book!!! I released the now quite exhausted bookseller and started signing. Finished more than 2 hours later. Sigh. I feel I've been holding my breath for a decade. And now, finally, with Bury Your Dead it's safe to exhale. Went off to another cocktail at a Providence bookstore last night then back to the hotel. Hotel Providence. Odd place. They call it a boutique hotel, and I'm not sure why. Feels like every slightly stuffy old hotel I've ever stayed at. But it's clean and my room had two lovely windows. The phones don't work, though. Can't call out, for some reason. And the concierge, in making a hair appointment for me yesterday, described me as an 'older woman' - so that bit of truth-telling didn't exactly endear me. I wonder how, and when, that happened? But in my mid-fifties I am definitely 'older'. I guess I just don't feel it. though, I suppose it could have been worse. She could have described me as an 'older man'. Or said, Ernest Borgnine's on his way over for a blow dry. That would have been hard to recover from! Off to a book signing in Mystic, CT at about noon....then to Madison, CT and a 7pm event at RJ Julia bookseller tonight. For those of you in southern vermont, I'll be at the Brattleboro Literary Festival for an event at about 3 tomorrow afternoon. Sarah's driving, thank heaven. And the weather looks great. Such fun to be traveling around, meeting people. Supporting this book. thank you all for your wonderful words about Bury Your Dead. It means so much. Michael and I keep in close touch. His son's going to be dropping by this afternoon and staying the night. Michael wrote to say he headed into the village this morning....had to stop to let a family of a dozen wild turkeys cross the road. Described the mist clinging to the hills. And the leaves turning. He stopped at the farmers market - and was apparently attacked by a cranberry/orange loaf, that followed him home. Poor boy. I miss him. Miss home. But thank heaven this tour has been so successful. I've been on tours that are just so hard - and disheartening. And then, being away from home is torture. This just feels like a quiet ache. Before I get into the details just two pieces of fabulous news. BURY YOUR DEAD is the Editor's Pick (4 of 4 stars!) in this week's People Magazine. And there's a full page ad on the inside back page of this week's New Yorker magazine - thanks to my US publisher, Minotaur. Yippeee!!! In Providence, Rhode Island now. Hectic few days! Had just a blast at Mystery Lovers Bookshop in Pittsburgh. Thank you Mary Alice and Richard, and the standing room only crowd. Feels so great. All those tours when no one showed up! I think that's a rite of passage - like falling off a horse. And landing on your ego. Because I went through that I am SO deeply appreciative when people do show up. So a very sincere thank you to the crowds to far!!! Mary Alice picked me up at the airport - and took me on the most harrowing drive of any book tour. This 'secret' shortcut. I probably should have asked her 'shortcut to where?' Heaven? Eternity? Laryngitis from shrieking? It was this single lane steep winding road (in Pittsburgh!). Mary Alice had to honk going around the corners (at about 100 miles an hour) so that whatever truck driver who might be bearing down on us would have a chance to say his prayers too. Dear Lord. There are NO atheists on book tours. And not, perhaps, a lot of clean underwear. Yesterday morning I had an early flight to Boston. The storm was coming in. sheet of rain in Pittsburgh and storm warnings for Boston. I was sure we'd be delayed, or the flight even cancelled. But everyone was perfect! No rain at all in Boston yesterday. Met at the airport by Sally, this GREAT publishers rep. She works really hard, setting up signings and driving all over the place. Very funny, very warm and effective person. The plane arrived about 11am and was in the hotel in Providence, RI by 4pm. Today there's a bookseller's cocktail - as part of the New England Independent Bookseller's Association bookfair. A signing tonight at 8 at Books on the Square, in Providence. A bookseller's breakfast tomorrow has been organized so I can meet more privately with some. Then off to a signing at Bank Square Books in Mystic, CT - about noon. tomorrow night there's a big event in Madison, CT. It's at RJ Julia Booksellers. It's a ticketed event. Five dollars, but the price can be applied to buying the book. It would be wonderful to see you there. Then on Sunday, I'll be at the Brattleboro writers festival in Brattleboro, Vermont. Fortunately the publishers know I have no sense of direction and will just as likely show up in Cleveland. So the magnificent Sarah Melnyk, a senior publicist at Minotaur, will be driving me all over for three days. Poor one. Fortunately for me the bar for authors us set pretty low. I think publicists are just happy if you're sober and clothed. will try to achieve at least those two things. Thank you, from the bottom of my heart, for all your kind words and support of Bury Your Dead!!! I am sorry that spoilers have happened, but I genuinely believe most of them are simply a surfeit of enthusiasm - and the difficulty in describing this book without letting some stuff out. But I'm sorry it is happening. For myself, I need to concentrate on all the great good energy and thoughts and support you're sending my way. And have for many years. I know how lucky I am. How can I not stand in the light when you are sending so much? the shadow, the critiques, are simply part of the price. Be well, my friends. I'll try to blog tomorrow, but it looks like a desperately busy day. Hope you can make it to one of the upcoming events.